The Me'or Einayim taught that a person's closeness to Hashem is commensurate with his observance of Shabbos. A friend of mine once remarked, "Often it happens that we're so busy throughout the week, and when Shabbos comes we just end up "keeping Shabbos" without really experiencing it." How would you advise a person to keep Shabbos in a way that elevates it to a level above mere observance of halachic detail? Shabbos is a halachic institution. The Kedusha of Shabbos flows directly from the minutiae of halachic detail. I would rather keep Shabbos than experience it, because while there may be benefit in the later even on a ruchnius level I believe that the ultimate value is in the former. It is the keeping of Shabbos, the observance of Hilchos Shabbos in accordance to halachah, about which I believe the Me’or Einayim spoke as corresponding to one’s closeness to Hashem. That is not to dismiss the question, but insofar as such a distinction was made it is worthwhile to remember which is the ikkur and which is the taful. In truth it is part of the answer. I believe that a major key in being able to experience Shabbos is to embrace it. One has to want to observe Shabbos, even the details, in order to experience it fully. Changing one’s attitude can be a difficult process but I believe that a significant part of doing so is watching the way one frames discussion about Shabbos. We must guard our self talk and not let any negative feelings go unanswered. And we certainly must be careful about how we actually speak about Shabbos. I would also suggest that one area where it pays great dividends, throughout the week, to be particular about observing the details is Shalosh Seudos about which the Shulchan Aruch says to be “extremely careful to fulfill” (O.C. 291:1). Wash and say Homotzi (O.C. 291:5, M.B. 295:23) and hold it after davening minchah (Rama O.C. 291:2). I am very grateful that I have had two friends who, at different times, have welcomed me into their homes and instilled into me the importance of Shalosh Seudos. It has sustained me when I’ve otherwise been struggling in my avodas Hashem. Going further I would suggest that one try’s to have Shalosh Seudos with chaverim. 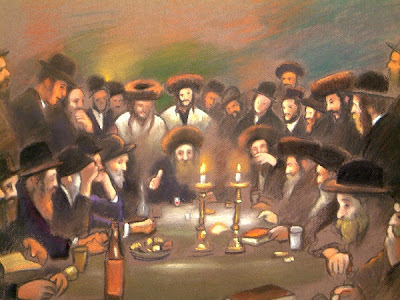 In addition to the additional chizuk one gets from gathering together with chaverim, it can serve as an apprenticeship for a more positive outlook when one sees others acting on such a positive outlook (even if they themselves are only elevated to such an outlook because of your presence as well). And don’t be afraid to extend Shalosh Seudos or otherwise delay concluding Shabbos a while. It can take some adjustment but acting with patience goes a long way. If possible do not turn motzei Shabbos in a time to catch up on melachah…or entertainment, doing so just trains you to look forward to Shabbos being over. There are many particulars to Shamiras Shabbos and it is an area where we all have more to learn. Many of those details can directly help us experience Shabbos rather than simply not desecrating Shabbos. We must be willing to approach it with a willingness to do what the halachah says we should do rather than doing what the halachah says we must do. Shabbos is a halachic institution. Beis Din is a halachic institution. Shabbos is a ruchniyusdike phenomenon of the world’s oneness with Hashem. This is where “[t]he Kedusha of Shabbos flows directly from”. In the siddur Tehillat Hashem, there is a quote from Kabbala about oneness of Shabbos (inserted into Kabbalas Shabbos service). I would rather keep Shabbos than experience it, because while there may be benefit in the later even on a ruchnius level I believe that the ultimate value is in the former. It is like saying that one would rather not get in a car accident rather than visit his parents. I agree that keeping Halacha is more important than “experiencing” Shabbos (and one must differentiate between real ruchniyusdike experience and fake emotions), but a mitzvah without kavanah is like body without a soul. Regarding the question of maximizing one’s Shabbos experience, well, it is like visiting a palace of a king. Depends what you’re interested in. I personally am interested in the king — so, I study about the king. Where can we learn about the King? Chassidus. “And the day of Shabbos should be totally devoted to the study of Chassidus. In general, it is important to treasure the time on Shabbos and use it to study the Torah, and not to use the time for useless matters. [In truth,] even during the week, one should be careful about these things, but in particular this applies on the holy Shabbos, for ‘the day is sanctified unto G-d our L-rd.’ It is given to the Jewish people to be satiated and to delight in His goodness. “Taking pleasure strolls on Shabbos is undesirable. For the only [material pleasure the Torah] permits on this [holy] day is to sleep slightly more than every other day, and to take delight in food and drink. And this is permitted only when a person’s intention is to honor the Shabbos, i.e., he should feel that this is being done for the sake of the honor of Shabbos, and [during this time,] he should be affected by the awe of Shabbos. The [all-]encompassing bittul which characterizes the Shabbos should affect him. — Rebbe Rashab (R’ Sholom Dov Ber) of Lubavitch, Kuntres Eitz Hachaim (Ch. XXV). "i would rather keep shabbos than experience it"
am yisroel got in big tsuris because we didn't ivdu H' bsimcha, serve H' with joy. do you realize what you are saying? earth to you earth to you, come in, come in, are you there??? the point of the hilchos is to foster a greater experience of shabbos. if one is not 'experiencing' shabbos then one must daven for the feeling. the tanya says that the revelation is w/in the words of the davening. we have to make ourselves available for it, fitting receptacles for it. what you describe is precisely why many jews run screaming away from observance. because they encounter jews who do not, G-d forbid, focus on the spirit, the feeling of the mitzvah. what is man? man is supposed to create a dira b'tachtanim in this world. that happens with the feeling!! the ruach. we are supposed to do all we can for that. i am in utter disbelief and dismay with this piece. are you joking? or do you need to go hang out with some real chassids like lubavitch or breslov. you need help brother, may H' help you and all of israel to really feel the mitzvos. "am yisroel got in big tsuris because we didn't ivdu H' bsimcha, serve H' with joy." Umm. That's a halachic obligation. Halachah is what makes Shabbos special. "are you joking? or do you need to go hang out with some real chassids like lubavitch or breslov." Yirmiahu: You seem to separate the experience from fulfillment of Halocho. This is very wrong from chasidic perspective. No, if you look carefully you will see I rejected that distinction. I would argue that my detractors have made such a distinction. An "experience" of Shabbos detatched from observance of halachah, even if it does not entail desecration of Shabbos is not an authentic ruchnius experience. It may be emotionally benifitial and indirectly help one's ruchnius but it is superficial. This, imho, similar to the superficial emotional excitiment some experience during davening which the Rebbe Rashab speaks about in chapter six of Kunteres HaTefillah. Not every emotional high is simcha shel mitzvah, even if it is in proximity to a mitzvah. I agree with the above, but you seem to think that if one simply fulfills Halacha, that’s enough to create an experience (correct me if I am wrong). That’s absolutely not true — at least, since the times of Baal Shem Tov — and assuming that is indeed what led to many problems in yiddishkeit. Halachah is what makes Shabbos special. To some degree, it’s a chicken-and-egg question. We are given a Halacha to keep Shabbos, because on Shabbos the world enters in unity with Hashem, but the world enters in unity with Hashem on Shabbos so that we can keep the Halacha of Shabbos — because by keeping Halacha in the physical world we create dira b’tachtoinim for Hashem. If by saying the above you mean something in terms of dira b’tachtoinim, i.e., focusing on the pnimiyus of what Halacha is, then I agree with you (but even then, you cannot access that level without experiencing the ruchnius of Halacha — no more than you can make a home for a king without creating a royal environment in it). If you mean that it is the legal aspect of Halacha as a contract that makes Shabbos special, then I strongly disagree. It seems to me that keeping Shabbos is the vessel. Experiencing it is the light. To receive the light, you need the vessel. Thus the vessel has priority, even though it is a means to receive the light. Ultimately, however, there is only light, and what appears now to be the vessel is completely subsumed in it. the problem is you create tsuris with your piece! if your piece was truly correct you would discuss both the keeping and experiencing of shabbos. we have enough trouble in the world. we don't need this kind of article that creates tension. you need to learn from how you are separating what is supposed to be one and whole. this is the original intention. please contemplate this so you will be chazak to am yisroel instead of divisive. These criticisms of the author are shtus. No offense to everyone, but he is expressing spiritual responsibility. Also, the comment about taking strolls on Shabbos- this is perhaps true for having ta'anug atzmi. But if this stroll is meaningful for one's wife and children, I doubt the same argument would apply. This is not to detract from the heavy importance of learning Torah on Shabbos, and generally sanctifying it in a way that is distinctive from the week. These are things which are derived from the neviim and are also halacha (mimtzo cheftzecha, daber davar, etc). what is true spiritual responsibility? to strive to live in the wholeness that is the truth of H' echad. the author divides. this is irresponsible. the author creates schism where in fact there isn't any. it is precisely this insensitivity or lack of awareness of the mesorah that drives jews away from yiddishkeit or keeps other jews from exploring it. when will you realize this? thank G-d there are many other jews who do. respectfully to asj: please consider not printing pieces that could create tension. it is one thing to have discussion. but a piece that creates stress and tension and divisiveness is not a kiddush H'. this has happenned before and i ask that you consider more carefully what you publish here. He is not being divisive at all. He did not criticize or speak negatively about anyone else or any practice. Nothing he said is a contradiction to any of the more "spiritual" aspects of Shabbos observance that were mentioned in the comments. He just focused on the growth in and observance of the halacha of Shabbos, which is in fact the basis for everything else. If you are breaking Shabbos, the best spiritual ideas will not change that. The only thing divisive here is these unnecessarily reactive comments, where the authors seem to be taking offense and things that were never even said, going so far as to ask ASJ to censor posts like this (?!?). Are you against the meticulous observance of halacha? In what way is that a stira to genuine spirituality? Chazal refer to the laws of Shabbos as "boulders hanging by a hair". If a person isn't constantly reviewing hilchos Shabbos, they will inevitably break shabbos. And the author is absolutely right that even under circumstances where our Shabbos "experience" is compromised, we still need to keep the Shabbos. I have been in such situations myself, and I see my very ability to experience a "spiritual" Shabbos under normal circumstances as a direct outgrowth of that. It ensures that my spirituality is genuine, grounded, and substantial, and not self-delusion G-d forbid. Remember that we are supposed to serve Hashem, not relate to things only in such a way that Hashem serves us, so to speak (ch'v). you know what? i'm thru here. i have tried from my heart to convey the lack of ahavas yisroel in the original piece and in the comments. most sadly, there is a chasm which i cannot bridge. may H' help and guide you to see what's really going on here. no one is objecting to meticulous observance. no one is suggesting lack of observance or less than shomer shalem. what you have failed to see is the ruach, the spirit of ahavas yisroel. none of it matters unless you have that. why do you think it was instituted to say "love your fellow as yourself' before davening, nu? may heaven help us, i have had it with people who refuse to see past their own narrow view of our tradition. i remain deeply in love with jews who understand how to bridge these chasms. i apparently fail miserably to qualify. never once in this dialogue has the author or commenters expressed a real ahavas yisroel. that is why i asked asj to not print such pieces: they create divisiveness, not dialogue. there is an important difference. may H' forgive me for any problems i have caused and may i as well as all of israel have peace with this. forgive me, but it's attitudes like yours that USED to make me disparage some religious people. now, thank Gd, i know that there are jews who have a true ahavas yisroel understanding and i refuse to be discouraged from narrow minded people who's hearts need some serious warming. may you be helped together with all of israel. asj, forgive me, i cant' deal with these people. ok. i publicly ask forgiveness for any negativity i have caused with my comments here. i hope that who ever read them will have rachmones and begin to understand that there are different perspectives and our interactions with our fellows in person or on the net must be with ahavas yisroel. that is what saves our people. that is what will rebuild the bes hamikdash. The original post didn't mention other people at all. He was responding to a question that was asked to him. He replied in with his personal thoughts on the matter. What is offensive about that? He was asked about his own opinion on how to deepen Shabbos observance. I seriously can't understand what could have offended anyone about that. Although I do apologize what I commented previously about aspects of the comments being "shtus". That was uncalled for. I'm sorry.